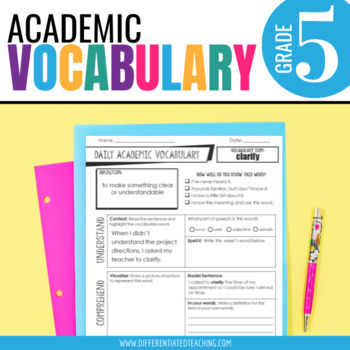 Limited vocabulary, especially academic vocabulary, can be a huge barrier to student success in fifth grade. In just 10 minutes per day, you can effectively build your 5th graders’ academic language skills with activities that focus on building a strong foundation word knowledge. 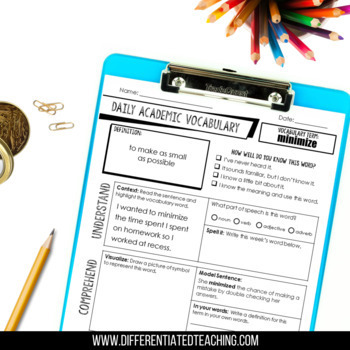 These simple, targeted vocabulary activities focus on Tier 2 vocabulary to help transition students fromword recognition to application. 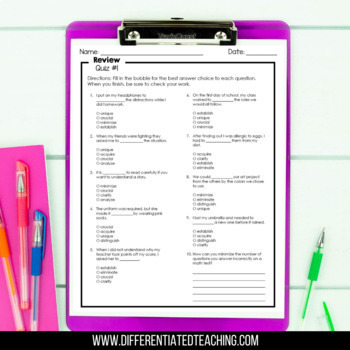 When used as a daily warm-up, it gives your students a chance to discuss and utilize academic language through the research-based format identified by Marzano and colleagues. This bundle includes 36 purposefully selected vocabulary words commonly seen on fifth grade assessments and academic tasks, and daily practice scaffolds from identification to application and analysis as students build a deeper understanding. 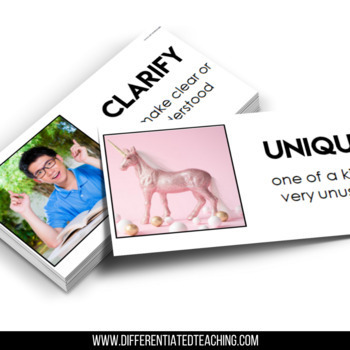 Perfect for classroom use, intervention groups, or tutoring.